If you are looking to make your site more engaging and interactive, then using online quizzes is an excellent tactic. Just look at sites like BuzzFeed which started creating viral content just by making some fun, interactive quizzes. Now, if you are a WordPress user, then you are in luck. In this article, we have put together a list of some of the best Online WordPress Quiz Plugins. All of these plugins are super simple to use and filled with a lot of features to help you create highly functional and interactive quizzes. Furthermore, we have made sure to keep the list as diverse as possible with a decent collection of free as well as paid plugins. That way, you will also have a great option despite your budget. WP Quiz Pro is one of the best and most feature-rich quiz plugins for WordPress. 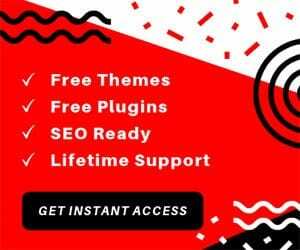 The plugin is packed with an impressive collection of features which can help you to help you create wonderful quizzes, and also utilize them to improve your site’s engagement levels, and generate more leads. Right out of the box, you will get options to create different quiz types starting from Facebook quizzes, Swiper Quizzes, Personality Quizzes, Flip Card Quizzes, Trivia Quizzes, and so on. You will get customization options to make your quizzes more appealing, along with integration with Social Media networks and email marketing services. All in all, this is one of the best quiz plugins you can have for your WordPress website. 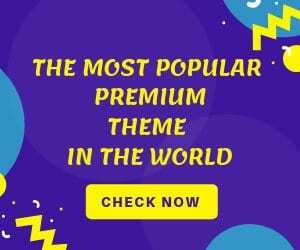 WordPress Viral Quiz, as the name implies, is a WordPress plugin which helps you create viral quizzes. It will help you create quizzes similar to BuzzFeed, and are filled with an extensive list of customization options to help you make the quizzes even more engaging. 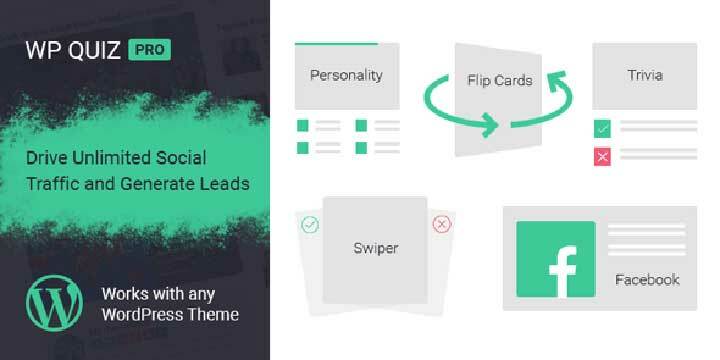 The plugin integrates social media sharing along with email marketing services so that you get more traffic and also generate plugins, as you engage your users with fun quizzes. Out of the box, this WordPress quiz plugin will give you the option to create Personality quizzes, and Trivia Quizzes. You can create multi-page quizzes, enable “share to view results” or “subscribe to view results” option, and much more. For customization options, you get custom CSS support along with two different skins – BuzzFeed Theme and Modern Flat Theme. Quiz and Survey Master WordPress plugin formerly went by the name “Quiz Master Next.” It is a very popular quiz plugin amongst WordPress users, which you can get for absolutely free off the WordPress repository. It covers pretty much all the basic features you will need, and if you require advanced functionalities, then you have the option to install premium add-ons. Speaking of features, you will get the option to customize the text of the quizzes, use different types of questions including multiple choice, open-answer questions, drop down, checkboxes, number, captcha, and so on. Each quiz can be configured to have numerous answer pages. You can also ask your users to provide their email addresses so you can mail them the results of the quiz or survey. Best Quiz Plugin for WordPress stays true to its name by being one of the most popular free-to-use quiz plugin in the WordPress market. With the WordPress quiz plugin installed, you will be able to create professional and dynamics quizzes with ease. Its intuitive interface allows you to create engaging personality quizzes, trivia quizzes, and flip card quizzes with ease. Now coming to some of the features offered by the plugin, you get options to add images and videos to your quizzes, create the quizzes in a single-page or multi-page layout, insert social media buttons, customize font and background color, and so much more. You will even get access to 6 animation effects to make the quizzes even more engaging. Shortcode support is also provided for easily integrating the quizzes on any page of your website. Quiz Cat is a free Quiz plugin for WordPress websites. But despite the free price tag, the plugin offers plenty of features which makes an excellent option even for serious marketers. The plugin can help you create the type of revealing quizzes, and pop culture quizzes, which we see on social media sites like Facebook. 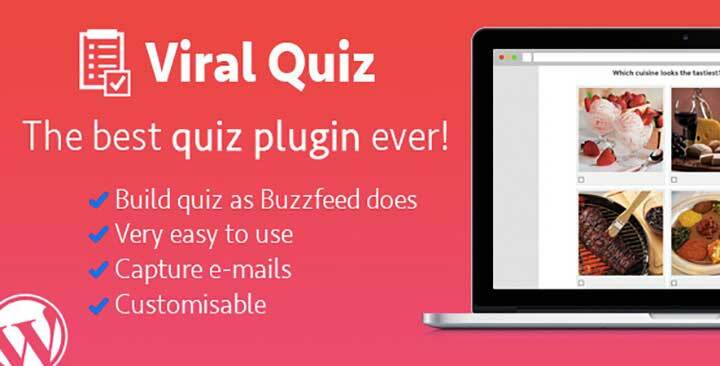 Once installed, this quiz WordPress plugin will give you a beautiful and intuitive interface for creating your viral quizzes. You will get the option to integrate images with your questions and answers to make them more enriching and immersive. There is also the option to create a starting page and finishing page for the quizzes. mTouch Quiz WordPress plugin, as you can guess for the name, has been developed with touchscreen devices in mind. If your traffic primarily comes from touchscreen-based mobile devices, then this should be an excellent plugin to keep on your arsenal. Now it should be noted that the plugin was created with learning in mind and this will help you to showcase academic content better and test your readers. Some of its features include options to provide hints with each question, provide a detailed explanation along with each solution, mention the points awarded for each question, customize a start and finish screen for the quizzes, randomize the ordering of the question on the quizzes, and much more. If you can get creative, there is potential to use these features to create viral quizzes as well. Advisor Quiz WordPress plugin allows you to create quizzes not only for fun but utilitarian purposes as well. You can create a quiz which will ask the user specific questions to act as filters and provide them relevant content. You can also implement count quizzes which you can use to take feedback from your users. Also for engagement and fun, you get the option to create trivia quizzes and personality quizzes. 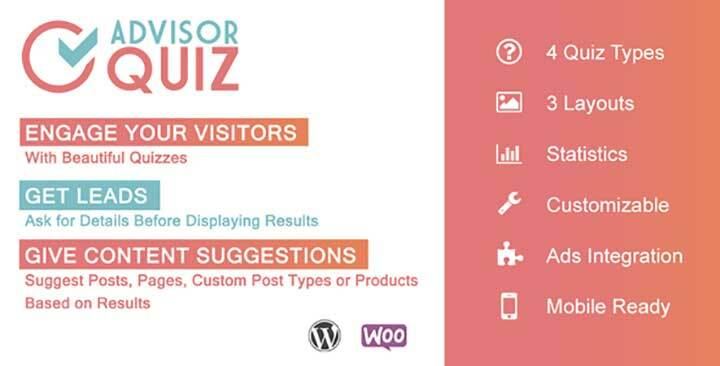 This quiz WordPress plugin also throws in a lot of customization option for the quizzes. First of all, you will get three different layout styles for your quizzes – a presentation format, image grid, and minimal. On top of that you get options to tweak around with the colors and fonts, the icons, add/change images, and much more. The plugin also supports custom JS and CSS, so that you can customize the quizzes to your liking. LearnDash is one of the best premium Learning Mangement System for WordPress. Besides helping you create courses and manage your students, the plugin also features a whole host of options to help you create stunning and engaging quizzes. You get a dedicated quiz functionality that allows you to create any type of quiz you like. The plugin for WordPress quiz supports different question types to make your quizzes even more interactive and engaging. Starting from multiple choice and single choice Q&A to free text, matching, essays, fill-in-the-blank, and surveys, the plugin has it all. You can even time the quizzes, randomize the questions, limit the number of attempts on per quiz, and much more. HD Quiz is one of the easiest to use Quiz plugins for WordPress. It comes with an intuitive interface with which you have the option to create an unlimited amount of quizzes. Now, this is also a free plugin, but it offers an abundance of options that can help you BuzzFeed style quizzes with ease. Some of the notable features of the plugin include the option to create an unlimited amount of quizzes, support for featured images for each quiz, support for tooltips with each quiz, option to integrate a quiz timer, ability to incorporate social sharing options, and much more. Now, if your sole purpose of integrating quizzes to your WordPress website is for gathering leads, then ARI Stream Quiz is an excellent plugin for the job. You can find the plugin in both a free and paid option. The free version covers all the basic functionalities, whereas the paid option brings more advanced functionalities to the table. Apart from all the quiz building functionalities, you will get integration with MailChimp, ActiveCampaign, and much more popular email marketing services. You can also give your users the option to share their results on different Social Media channels, which will help you generate more traffic, which equates to more leads. 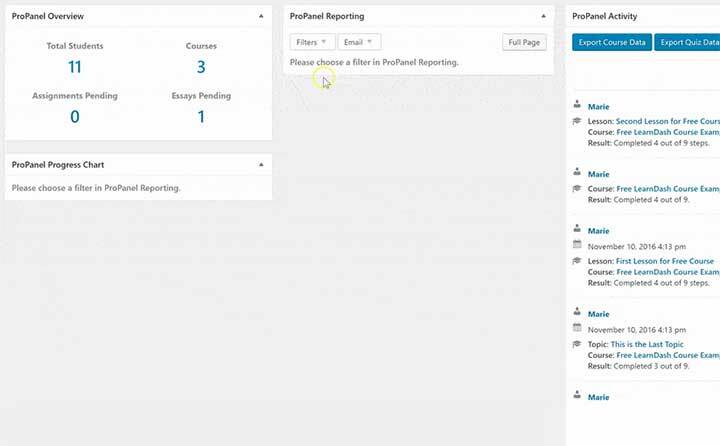 LearnPress is much more than a Quiz plugin for WordPress, in the sense that it is a full blown LMS (Learning Management System) plugin. However, it features a lot of options and functionalities that can help you set up quizzes on your site. Once installed, the plugin will provide you with an intuitive interface from where you can create quizzes as well as lessons for users coming to your website. Now, most of the features of this WordPress quiz plugin are geared toward helping you build courses for your users/students. But there is a decent collection of features to help you build functional quizzes as well. You will also get added functionalities to help you better manage the quizzes. There is even a paid add-on which will allow you to create random quizzes, such that each student gets a different quiz in the same course. Any Other WordPress Quiz Plugin? So these were our picks for the best Online Quiz Plugins for WordPress. We hope you found this to be helpful. Do remember to share it along with your friends or colleagues who are also searching for a quiz solution for their WordPress website. Again, if you have used any of the plugins mentioned here on the list, then don’t forget to write about your experience in the comments below. Your contribution will be much appreciated and help fellow readers.